Family Tree Magazine published a review of Heredis for Mac 2 (released back in June) in the October/November 2012 print edition of Family Tree Magazine. Anyone who’s ever done genealogy on a Mac will be able to jump right in and start using Heredis, no manual required (though there’s an 89-page PDF user guide, just in case). Fast and easy data entry is a particular point of pride for Heredis, which lets you enter and edit data not only on an ancestor’s “card,” but also in a Family Group Data view. Maps for your ancestors’ places are generated automatically—no more wondering where that village is located. Almost everything, including the toolbar, is customizable. Synchronizing with the optional iOS apps or with Heredis on other Macs, and even PCs, is a snap. Speaking of Heredis for iOS, Heredis 1.0.1 for iOS (Mobile Genealogy) was released last week. If you want to read the whole review, I received my copy of the October/November edition of FTM this morning, and it’s on page 70. It might already be on the racks in some of the larger stores like Barnes and Noble. If you are a Family Tree Magazine Plus Now! member, you can read it here. 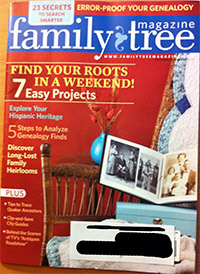 Family Tree Magazine has always done a good job of covering Mac genealogy software and this follows that trend.